Simply put, he’s the only experienced, proven stakes horse who is moving in the right direction and who is doing the things a classic horse is supposed to be doing on a consistent basis. His victory in the Fountain of Youth Stakes was convincing and flawless in every way, as is his pedigree. He has shown he can beat you sprinting, he can beat you with an explosive turn of foot from off the pace, and he can be you with a long sustained run from far back and just keep going, as he did in the Fountain of Youth, where he was being pushed along from almost five furlongs out. That’s long a long way to maintain such a strong run and continue to pour it on, opening up by almost 6 lengths at the finish. And he did it on a slow cuppy track. This colt has such a low efficient stride, he seems to be in perfect rhythm throughout the race. With so many big-name horses either having physical and mental setbacks or throwing in inexplicably poor performances it is refreshing to have a horse like this, who keeps going from strength to strength. And what a story behind him. Here is a horse with a paltry $16,000 price tag as a yearling, yet possesses a million-dollar pedigree and was picked out and is conditioned by a trainers school graduate who came to the U.S. after being kidnapped twice and held for ransom in his native Venezuela. How can you not root for this horse? It must be pointed out that he wears four bandages, which to some sends up flares, but we’ll point out that Smarty Jones, Street Sense, Fusaichi Pegasus, and Mine That Bird all won the Derby wearing front wraps, so I wouldn’t make too much of that. The good news is that he is back galloping after suffering a slight ankle strain. He’s fortunate his injury was as minor as it was and that Wilkes scheduled him for three preps instead of two. Having only two preps obviously has worked in recent years, but when something like this happens, such a conservative schedule means the end of the Derby trail. He’s still a very serious horse, and there’s nothing to do now but monitor his works and wait until the Blue Grass Stakes and see how he returns and how much he gets out of the race. Wilkes said he was blowing after the Sam F. Davis Stakes, his first start away from Churchill Downs, which was good to hear then and even better to hear now, because we know that race did him a lot of good and put some air in his lungs, all of which will be beneficial now that he has an unexpected two month gap between races. With 20 points, he needs only a strong in-the-money performance with a big final quarter to get him in the Derby and set him up well for a top effort. He finally gets his opportunity to show where he belongs on the Derby trail. It seems the only way to maintain your status this year has been to stay in the barn, as all the top-ranked horses have had their problems on and off the track. He had another long sharp work, going 6 furlongs in 1:12 3/5, and it is apparent Baffert has him primed for a big comeback effort. There is no way of knowing yet how his speed matches up with Gormley’s and Iliad’s, but these horses have to be careful not to get into a blistering speed duel with each other and possibly compromise their chances to move forward in their final prep and ultimately the Kentucky Derby. It’s not a question of whether you win or lose this race, but how you win or lose. You have two fresh horses and one who has never been two turns, and whoever else shows up for the race. This is all about style points as much as it is where you finish. We have no idea how good Iliad is, but, and I know this sounds crazy, it is hard to imagine Bob Baffert getting beat by a horse he used to train and who was taken away from him. It’s just a bizarre scenario. Baffert’s main focus every year is on the Derby and here he is going against a horse he developed who is out to prevent him from getting there. After his dazzling 6-furlong drill in 1:11 on a slow track, which Shirreffs called a “wow” work, and the way he finished and galloped out, you know he’ll be razor-sharp and fit for the San Felipe Stakes. Shirreffs particularly liked how he finished up with his ears pricked, considering how fast he went early, the result of his workmate getting tangled up with a pair of gallopers and his rider Victor Espinoza breaking from the pole in a flat-out run. Shirreffs said Espinoza told him Gormley wanted to take off again on the backside following the work. He added the colt is “quick into stride, then settles.” After that fast a work, Shirreffs went easy with him Monday, breezing him 5 furlongs in a leisurely 1:02 2/5. We know Gormley can control a race on the front end, as he did in the FrontRunner Stakes, and we know he can stalk, as he did against American Anthem in the Sham Stakes. Like Mastery, he has plenty of fitness and bottom under him and we’ll see where Espinoza places him. I’m well aware this is a very bold move, especially the way I feel about horses who have only four career starts before the Derby. But this big leap was done purely on gut instinct after having watched and studied his three races and coming away with the feeling that this colt is far more mature and professional than one would think from a horse having so little experience. He also is one of the most determined young horses I’ve seen in a long time. He just seems to have an amazing competitive spirit, as indicated by the way he pins his ears in all his races and even pins them galloping out after the race, which you don’t often see. In his career debut, he fought between horses in blazing fractions, was headed in the stretch by the 2-1 favorite Excitations and battled back to win by a head, with a 9 1/4-length gap to the third horse. And Excitations came back to win his next start by almost 3 lengths. In his grass race, the Keith Gee Memorial Stakes, he got pinned down behind a wall of horses turning for home, but split horses and battled hard down the stretch, despite not taking to the turf, to fall just short of catching the undefeated grass specialist Cowboy Culture. Again, he kept fighting past the wire with his ears still pinned, quickly passing Cowboy Culture. He only ran in this race because he needed a two-turn race after being unable to run in the LeComte Stakes because he was stuck at the Evangeline Downs training center during the equineherpes quarantine at Fair Grounds. The more I watch the Risen Star, the more things about him I like. He has a tremendous physical presence and the look of a classy colt with a powerhouse of a stride who dominated a good solid field with far more experience. We know he likes running inside horses, can beat you in a dogfight or run off from you, and just seems to be improving very rapidly. With so few horses to get really excited about I decided to put him right in the mix. He returned sharp and showed he’s made the transition from 2 to 3, and while he didn’t need to win, just take a positive step forward, his powerful early charge to the lead on the turn and inability to sustain it to the wire still raises the question of stamina. It’s not that his pedigree is devoid of stamina and is so purely speed oriented, but there is enough speed to raise questions following two straight two-turn races in which he made a threatening move at the head of the stretch, only to lose considerable ground in the final furlong; this coming after two gutsy victories in the one-turn Hopeful and Champagne. The Breeders’ Cup Juvenile performance was understandable coming off that grueling slugfest in the Champagne in near-record time. And you can say he simply was a bit short in the Fountain of Youth coming off a layoff. But having only two preps before the Derby, he now has only one more shot to show he can run a Derby-winning race going two turns. One of the positives to take from the race was the explosive run he made around the far turn. It would have inspired more confidence had he sustained it a while longer and not had so much trouble outbattling the pacesetting Three Rules for second after Three Rules had put away all the horses chasing him, including the even-money favorite Irish War Cry. Being old school, I’m a sucker for a Champagne/Hopeful winner, so I’ll still consider him a top contender even with all the uncertainties. How about losing a major player in Not This Time and coming up with this colt, who stormed on the scene with a powerful performance in the Gotham Stakes, earning a lofty 102 Beyer speed figure. What I like the most was the 7 1/2-length gap between the second- and third-place finishers. But let’s not forget that the second-place finisher was coming off one 6-furlong maiden race and ran a terrific race, just as American Anthem did in the Sham. J Boys Echo has now won at Churchill Downs, Keeneland, and Aqueduct, and ran a respectable fourth at Delta Downs, in which he ran an odd back and forth type of race in the Delta Jackpot, well behind Gunnevera. But if you want a reason to really like this colt, go back and watch his maiden victory at Keeneland. Hopelessly blocked behind horses at the head of the stretch, he got shoved almost into the rail, but recovered so quickly he burst through an opening and was three in front in a matter of a few strides, not even missing a beat. He continued to draw off as if nothing had happened, winning by 5 1/2 widening lengths. His Thoro-Graph figures after his fast-closing third in Withers Stakes pointed him out as the most likely horse to upset El Areeb, but he ran beyond expectations, charging past everyone, this time with a sweeping outside move, with the same burst of speed we saw in his maiden score. So in looking for a Derby horse you can’t go wrong with a horse that hits openings with the quickness this colt does, inside or outside. He’s even more dangerous because he is a powerful closer who has the tactical speed to stay within striking distance. You know things are getting desperate when I have two inexperienced horses this high up, and this colt still has had only two career starts. So, when you’re desperate, why not turn to Baffert, who has this colt sitting on a monster effort in the Rebel Stakes, a race he’s only won six of the last seven years. And he has to travel 1,700 miles to get there. American Anthem, who ran one of the gamest races all year when he dropped a nose decision to grade I-winning Gormley coming off only one 6-furlong maiden race, continued his brilliant works with a 6-furlong drill in a bullet 1:12 1/5 from the gate. With One Liner skipping the Rebel Stakes, and with Baffert’s remarkable record in the race, you know he’s going to be bet heavily. The question is, does he go to the front again or come from off the pace as he did in his maiden score? He is going to run into a very fast powerful colt in Uncontested, who will improve dramatically off his Southwest failure. He no doubt has the speed and the talent, and we’ll find out in the Rebel if he has the class to go on and be a force in the Derby with so little experience. Like with the other lightly raced horses mentioned above, can his raw talent overcome having only four career starts before the Kentucky Derby and, in his case, a pedigree geared toward speed? Unlike Girvin and American Anthem, he will have two sprints and only three starts in 9 1/2 months. With his career debut coming way back in July, he will, for all intents and purposes, go into the Derby off only three starts. If he can pull it off it surely would silence most of the Pletcher critics when it comes to the Derby. As mentioned, he does have that raw talent, which was on display in the Southwest Stakes. But Pletcher has elected to bypass the Rebel Stakes and give him just one more prep. As a result of his conservative approach, One Liner has yet to work since the Southwest Stakes. 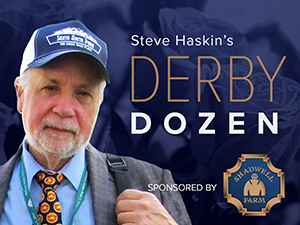 He breezed an easy half in :50 4/5 for the Tampa Bay Derby next Saturday, as he attempts to duplicate or improve off his strong runner-up performance in the Sam F. Davis Stakes. With McCraken out of the picture, he could take on the role of favorite, and we’ll see if he can patent that late closing kick he showed in the Sam Davis. He actually did not appear that strong at the top of the stretch, and it wasn’t until McCraken cleared him and let him get to the outside that he leveled off and found his best stride. As a $1.2 million yearling purchase, one can only imagine the reaction to his career debut at Saratoga when he finished 10th, beaten more than 18 lengths. But that race was quickly forgotten when he won his next two starts, including the Pulpit Stakes, before his seemingly breakout performance in the Sam Davis. He has a mixture of speed and some stamina in his pedigree, and he is inbred to In Reality, something I always love to see, even if this inbreeding is not through the stamina branch of In Reality’s pedigree. He is also inbred to Seattle Slew. A newcomer to the Dozen because all signs indicate he is sitting on a big performance in the Tampa Bay Derby. In his fourth-place finish in the Sam F, Davis Stakes, he was 4-wide around the first turn and remained four-wide pretty much the remainder of the race. He made a big move around the far turn to stick his head in front turning for home, but not having run in 2 1/2 months and racing wide throughout most of the race, he battled on gamely to be beaten only 3 1/2 lengths by McCraken. According to Trakus, he raced 46 feet farther than McCraken, 49 feet farther than Tapwrit, and 55 feet farther than 3rd-place finisher State of Honor. That is such a significant amount of ground loss, his Thoro-Graph figure for the race is noticeably faster than Tapwrit’s and State of Honor’s, and just about even with McCraken. Remember, this is a horse who gave McCraken all he could handle in the Kentucky Jockey Club Stakes, giving way late to be beaten only 1 1/4 lengths, and before that was third to Classic Empire in the Breeders’ Futurity after setting a fast pace under pressure the whole way. He also broke his maiden impressively at Churchill Downs. I find him a huge potential overlay in the Future Wager at a whopping 120-1.With his expected improvement in the Tampa Bay Derby, he looks to be a very intriguing horse. Another newcomer to the Dozen. The San Felipe will be the big test as he stretches out to two turns for the first time and attempts to match his speed against Mastery and Gormley. If he can outrun those two grade I winners around two turns and emerge victorious he obviously would catapult himself right into the upper echelon of Derby contenders. Trainer Doug O’Neill put some bottom in him, working him seven furlongs in 1:26. His Beyer speed figures are climbing and his fastest number actually is higher than Mastery’s and Gormley’s, but again it was in a sprint. And his Thoro-Graph number in the San Vicente also was extremely fast, so it will come down to how far he can carry that speed, but more important whether or not he can harness some of it. You don’t want to see a potential Kentucky Derby horse fighting on the lead through a half in a blistering :44 flat. That’s not going to win you the Derby. Ironically, his half-brother, Melmich, won stakes in Canada at 1 3/4 miles and 1 1/4 miles and placed at 1 5/8 miles. His maternal great-grandsire Swoon was a stakes winner at Santa Anita at 1 1/2 miles and placed in the San Juan Capistrano at 1 3/4 miles. So we’re talking heavy duty stamina to help him stretch out. This is by far the most jumbled and frustrating Derby picture I can remember, and why I decided on a major shake-up this week. When a leading Derby contender gets beat it is certainly excusable. But when they get beat as badly as IRISH WAR CRY and EL AREEB did without any apparent excuses, there is no choice but to move them to the outside looking in, just in case they make some dramatic improvement next time out. Neither of their trainers is offering any excuses, and you simply cannot have that bad an off day on the Derby trail, with so many horses pounding on the door. Irish War Cry’s performance was so baffling and so unlike what we saw in his first three races it just makes little sense and defies explanation. But they are horses and you just never know. I had been hoping to see the Irish War Cry we saw in his maiden race when he made a monster move on the turn from back in the pack, but it was pretty obvious he was not happy sitting off THREE RULES and kept trying to go after him, even to the point where he was outrunning a rank speed horse in TAKAFUL. That’s just not what you want to see. So did he sulk not getting the lead and just decided to call it a day? Did he simply not get hold of the slow, cuppy racetrack? Who knows? All I know is it’s a shame to see such a talented horse run so poorly, especially after the way he worked last week, letting his workmate open 6 lengths on him and finishing up so strongly. To work so brilliantly and then run the way he did has to be extremely frustrating to Motion, who can get a horse to relax as well as anyone. Although nothing as been decided regarding the Florida Derby, it wouldn’t come as a surprise to see him give the colt a little extra time and wait for the Wood Memorial or Blue Grass Stakes. With McCraken and Classic Empire possibly knocking heads at Keeneland, perhaps the Wood will be in play and he can train out of Fair Hill, which would give him a nice relaxing setting. I still foresee him getting back on the Dozen. But it is going to take a huge bounce back performance to get back to where he was after the Holy Bull. It wouldn’t surprise me to see such a performance. Three Rules ran a gutsy race and battled hard to the end, just giving way to Practical Joke for second, but there is a big question of how far he wants to go. We’ll see if they give him another shot in the Florida Derby. The way he held on after the others tracking his fast pace wilted badly, showed he can compete with the best of them. But one would think the Preakness would be more his speed. The Wood Memorial has not been ruled out for El Areeb, despite his well-beaten third in the Gotham, in which he finished 11 lengths behind J Boys Echo. His trainer, Cathal Lynch, attributed the defeat to the fast pace and said the colt came out of the race in excellent shape. Runner-up CLOUD COMPUTING ran a terrific race coming off only one 6-furlong maiden victory. The son of Maclean’s Music was always close up in third and ran on well in the stretch to finish 7 1/2 lengths ahead of El Areeb. Trainer Chad Brown is considering the Wood Memorial, but would he run the colt in the Kentucky Derby off only three lifetime starts and none at 2? For those surprised to see CLASSIC EMPIRE taken off the Dozen, there is still plenty of time to put him back on once he finally starts working steadily and looks to have his head on straight. I just don’t want to use a spot waiting for him to show some positive signs with the Blue Grass Stakes still so far off. As of early Tuesday morning, there had been hope he would work this morning, and if he does, I will update. So far we’ve seen him wheel coming out of the gate unseating his rider, refuse to work, become upset during the van ride to Gulfstream, sweat up in the post parade, act up at the gate, and have a foot abscess and a back problem. He recently was seen in a video tearing around his pen like a wild bronc. His latest adventure was refusing to work and returning with an apparent back problem, which has since been corrected by an equine therapist. So as the Casses take it day to day with him, I will take it week to week, and when they are confident they can have a professional horse ready for a big effort on Derby Day, as they did for the Breeders’ Futurity and Breeders’ Cup Juvenile, then he likely will return to a prominent place in the Top 12. How important and widely anticipated is the Blue Grass Stakes going to be if Classic Empire and McCraken square off, not only for points and to get back on track for the Derby, but possibly for Derby favoritism? Between the career-ending injury to Not This Time, the big disappointments of Classic Empire and MO TOWN, the injury to McCraken, losing KLIMT for at least several months, and with SYNDERGAARD only beginning his comeback now, it leaves only four of the top 10 horses on the Experimental Free Handicap still going strong on the Derby trail – Practical Joke, Mastery, Gormley, and Gunnevera. And we’ll know more about Mastery and Gormley on Saturday. Want to know the real sneaky race of the weekend? Ask yourself this question: Can a front-running horse who crawls his half in :51 3/5 and 6 furlongs in 1:16 4/5 in a 1 1/8-mile allowance race run in a tortoise-like 1:53 2/5 at odds of 1-10 against an extremely weak field be considered a legitimate Derby horse? The answer is yes. When ALWAYS DREAMING won in a laugher by 4 lengths, it was the first race on the card and the track was like the beach after the wind had dried it out. Watching the son of Bodemeister walk to the gate, you could tell you were looking at an exceptional colt. He made a handsome picture and just had such a relaxed commanding presence about him. He shot out of the gate from the rail and just cruised around there in a public workout with John Velazquez not asking him in the slightest until inside the sixteenth pole. That’s where the sneaky part comes in. Despite still being under wraps around the far turn and well into the stretch, he still was able to run that quarter in :24 1/5, followed by a :12 1/5 final eighth. When Velazquez finally started pushing on him in deep stretch he came home his final sixteenth in just about :06 flat. Yes, a horse going that slow early is supposed to come home fast, but he was still in a common gallop during those closing fractions. He then galloped out strongly, going the mile and a quarter in about 2:07 1/5. Yes, that sounds slow, but on that track, you can bet it put a lot of bottom in the horse. He will get his first and only class test in one of the major preps, where he’ll desperately need points. But the feeling here is that is a horse to keep an eye on, who you could have gotten at 42-1 in the latest Future Wager. Always Dreaming has a fascinating pedigree. His grandsires Empire Maker and In Excess should give him enough stamina, with In Excess still holding the Belmont track record for 1 1/4 miles, winning the Suburban Handicap in a blazing 1:58 1/5. His second dam is a half-sister to Secretariat and his tail-female line has some old-fashioned California bloodlines, with his third dam being by Terrang, winner of the Santa Anita Handicap and Santa Anita Derby, and Terrang being a son of Khaled, the sire of Swaps. If you offered me two tickets on any two horses in the Future Wager with a chance to make a real killing, I would take the aforementioned Wild Shot at a ridiculous 120-1 and also PETROV at an equally ridiculous 73-1, especially since the horse he just ran second to closed at 12-1. I came very close to putting Petrov in the Top 12 this week, but opted for Iliad because he’ll be running first. With the Derby picture is such shambles, I simply like everything about this horse and have a great deal of respect for him. He had to do all the dirty work chasing Uncontested in his last two starts and would get a more suitable trip in the Rebel Stakes, as long as he doesn’t chase American Anthem. The question is whether to run or wait for the Arkansas Derby after a pair of tough races. But it seems at this point they are leaning toward running. His Beyers are climbing noticeably every race, jumping 5 points, 5 points, and 10 points up to a 96. I believe he has a big closing punch and just hasn’t been able to use it. Even if he can get himself into the Derby off a bunch of placings in big races, just as Giacomo did, it could be a different story on the big day, where he should be able to run a race more conducive to his best style. Don’t dismiss this horse even if he keeps running second to faster horses going 1 1/16 miles. Speaking of UNCONTESTED, it was good to see him bounce out of the Southwest Stakes with a bullet 1:00 flat breeze, fastest of 32 works at the distance. I strongly believe the Southwest was a total throw-out, and we’ll see the real Uncontested in the Arkansas Derby, where he’ll be equipped with a tongue-tie to help prevent him from displacing and losing his air. But I still want to see him rate off the pace, getting into a nice rhythm with those big long strides. There is just too much speed in this year’s Derby. Another highly regarded 2-year-old to return a big bust at 3 was NO DOZING, who flopped big-time in the Sam F. Davis over the same track on which he was training so brilliantly. Following his most recent work at Tampa, a 5-furlong breeze in 1:01 3/5, with a final eighth in :12 1/5, he will be given a chance for redemption in Saturday’s Tampa Bay Derby. The lightly raced BEASLEY, who scratched out of the Fountain of Youth to await the Tampa Derby in what looks to be a smart move, worked a razor-sharp half in a bullet :46 4/5 at Gulfstream Park, fastest of 58 works at the distance. The way the Fountain of Youth was run, he would have had his work cut out for him just to finish in the money. With so many live horses in the Tampa Bay Derby, note that Mark and Norm Casse are very high on STATE OF HONOR and cannot wait to see how he runs in his third start on dirt, having previously raced on Polytrack. They feel he is just now getting used to it. Although he was on the lead in the Sam F. Davis, hanging on determinedly in the stretch to finish third, he did come from off the pace in his head defeat in the Mucho Macho Man, but let Sonic Mule come back and beat him, after which Casse equipped him with blinkers. One of my favorite handicap angles is second race blinkers on. I’m expecting another good effort from him and he should give Wild Shot and Tapwrit all they can handle, especially if he can take back off the pace this time. It was a good weekend for Kenny McPeek. First he sent out OXFORD LANE to defeat older horses in a one-mile maiden race at Oaklawn Park, and then later that night he saddled IT’S YOUR NICKEL to an impressive 6 1/2-length score in the John Battaglia Memorial Stakes at Turfway Park. Another son of Dialed In, It’s Your Nickel made a powerful sweeping move from some 10 lengths back and blew by the WEBN Stakes winner EN HANSE, drawing clear with every stride. He does have experience on dirt, coming off a victory via disqualification in a one-mile allowance/optional claimer at Fair Grounds. He likely will head for the Spiral Stakes at Turfway. SENIOR INVESTMENT, the horse who was taken down in the allowance race won by It’s Your Nickel, flattered that race even further by coming back to win a 1 1/16-mile allowance race by 3 lengths at Fair Grounds on Feb. 18, earning a shot at the Louisiana Derby. If there are still any 3-year-olds who hope to make it as late-comers to the Derby trail, they could be running in a 1 1/16-mile allowance race at Santa Anita Thursday, which will feature the recent Bob Baffert-trained maiden winner REACH THE WORLD, who scored by 3 1/4 lengths going 1 1/16 miles, and BATTLE OF MIDWAY, who finished a solid third behind Iliad in the San Vicente Stakes and will be stretching out to two turns for Jerry Hollendorfer. The son of Smart Strike had previously broken his maiden by 3 1/4 lengths in a blazing 1:09 flat in his career debut. Baffert has also entered the highly regarded IRISH FREEDOM, who won his only start last August at Del Mar and has been working brilliantly. Zayat Stables’ Pioneerof the Nile colt GLENNRICHMENT was scratched out of the Gotham Stakes and then broke his maiden the following day, winning wire-to-wire by 4 1/4 lengths. Chad Brown unveiled a promising colt when he sent out TIMELINE to an impressive come-from-behind victory in his career debut, defeating the Nick Zito-trained GIUSEPPE THE GREAT. Another maiden winner at Gulfstream on Saturday was the Shug McGaughey-trained EASTPORT, who scored by a length in his two-turn debut. If you haven’t gotten your fill of Pletcher horses yet, BATTALION RUNNER, who missed some training following his allowance win over Beasley and had to bypass the Fountain of Youth, breezed a sharp 5 furlongs in a bullet 1:00 2/5, fastest of 13 works at the distance, almost all of them Pletcher horses. Also on the worktab were MASTER PLAN (5 furlongs in 1:02 3/5), MALAGACY (5 furlongs in 1:02 2/5), and SONIC MULE (a half in :49). Robert Lewis Stakes winner ROYAL MO worked 6 furlongs in 1:14 4/5 for trainer John Shirreffs. The son of Uncle Mo will work again Saturday in preparation for the Rebel Stakes. The improving SILVER DUST, a good fourth in the Southwest, tuned up for the Rebel with a sharp 5-furlong work in 1:00 4/5. Finally, our condolences to the connections of Louisiana-bred SAINT’S FAN, who was injured in a workout at Fair Grounds and had to be euthanized. He looked to have a bright future for Dallas Stewart, who trained, owned, and bred him.